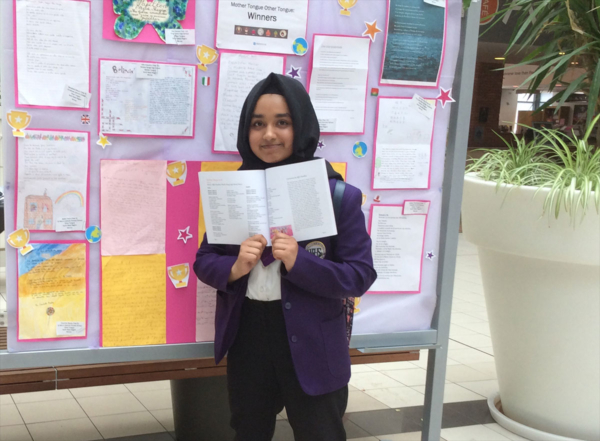 For the second year running, a student from Whalley Range 11-18 High School has won the Regional Mother Tongue Other Tongue competition in the Mother Tongue category. Congratulations to Afifa (10RP2b) on winning the Mother Tongue category of this prestigious and national competition! Mother Tongue Other Tongue is a multilingual poetry competition to celebrate cultural diversity. It is a national project originally developed by Manchester Metropolitan University and Route into Languages North West. Our World Languages Leaders promoted the competition in school as well as entering it themselves. We took eight students who entered the competition to a celebration event at Manchester Metropolitan University. Malala Yousafzai (Nobel Prize winner) endorses the competition. She was there to congratulate the winners personally and gave a very inspirational speech about education and languages. The event was a fantastic opportunity for the students to celebrate languages and to discover poems from other schools. Malala was a surprise guest. Our jaws dropped when we heard that she would be speaking and giving out the prizes. It was a magical moments that we wished we could have shared with the whole school. We feel very privileged!